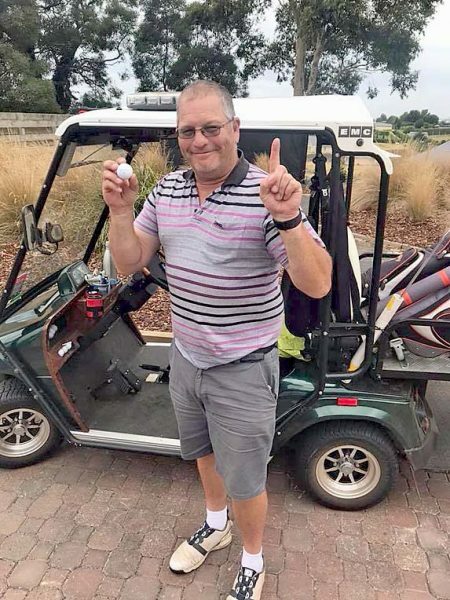 ON TARGET: Trent Eitzen was pleased with his hole-in-one on the eighth hole at the Attamurra golf course on the weekend. TRENT Eitzen schooled the field on Saturday at the Attamurra golf course, with an excellent five-up and along the way claimed his maiden hole-in-one on the eighth hole. In A Grade it was Eitzen then daylight, with Joe Clements limping into second on one-down. In B Grade it was a much closer affair, with Graham Greenwood, four-up, claiming victory by count-back from hard working committeeman Michael Rees, also on four-up.